A star-shaped, dark brown pod that contains a pea-sized seed in each of its eight segments, and native to China, star anise comes from a small evergreen tree, it's heritage is the magnolia family, and its flavor is slightly more bitter than that of regular anise seed. In Indian cooking, star anise is used to make masala sauces, curries, and braises. It is also a key ingredient in Vietnamese pho. Star anise is a commonly used as a spice and tea flavoring and it's also widely used to flavor liqueurs and baked goods in Western cultures. It's also used to make Sambuca, pastis, and absinthe. It can be found whole in Asian markets and some supermarkets, and as a ground ingredient in Chinese five spice powder. 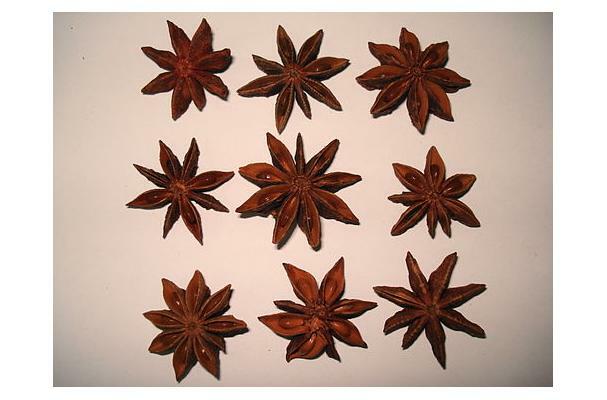 As the name suggests, star anise is star shaped with between five to ten boat shaped sections, eight is the average. Tough skinned and rust colored, the fruit is picked before it can be ripened, and dried. The aroma is more pungent and powerful than anise, and licorice-like. Buying: Star anise, though harvested from March to May, will keep for up to a year when stored in air tight containers. Therefore, the spice is available year long. Being considered a less expensive alternative to aniseed, Star anise has become more popular in the West. Star anise is most often found whole in stars. Procuring: Star anise, native to China and Vietnam is, today, grown almost exclusively in southern China, Indo-China, and Japan, though there are some growers in Jamaica and Laos as well. The pods are harvested just before they ripen (March through May), then sun dried. The whole star can be added directly to the cooking pot then removed just before serving. Otherwise grind stars as needed. Use this sparingly as the flavor is quite strong. A small to medium tree in the magnolia family, growing to a height of around 26 feet. The leaves are lancelote and the flowers are yellow. Propagated by seed, the trees are mainly grown in China and Japan for export and the home market. Stored whole in an air tight container, star anise will keep for about a year.